The Andromeda Galaxy, M31, is the nearest spiral galaxy to our own Milky Way. 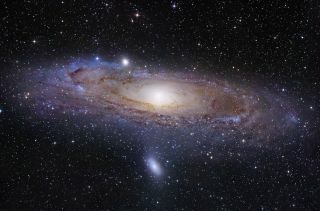 A group of astronomers is inviting the public to join their star-hunting team in a search of the bright Andromeda Galaxy. The project aims to identify star clusters in our neighboring galaxy, also known as M31. All it takes to find the clusters in Andromeda is an Internet-enabled computer and a desire to help, said Anil Seth, the team's lead investigator. "No special training is required," he said. The so-called "Andromeda Project," which began Wednesday (Dec. 5), will generate the largest sample of clusters from a single spiral galaxy when it is completed. "The general benefit is to better understand how spiral galaxies form," said Seth, an assistant professor of physics and astronomy at the University of Utah. "Andromeda is the nearest example of a [spiral] galaxy, except for the Milky Way," he said. "We can study in detail things we can't see in larger distances." The massive project is taking up two months of Hubble Space Telescope time, making it one of the largest surveys completed by the telescope. Around 20 institutions are involved with many different science goals; Seth's group has one of the projects. At first, Seth's team manually identified 600 clusters in 20 percent of the images that had been taken so far. The process took months. They aimed to automate the rest of the search using a computer program. But when the team asked the software to do the same thing, difficulties arose. Since the background of the galaxy varies behind the star clusters, this made it difficult for an automated program to do the job. "We couldn't get to the point where we could pick out a large number of clusters we identified by eye," Seth said. "There were thousands of candidates that weren’t real clusters." Around this time, the Zooniverse website caught wind of Seth's work and proposed a different approach: crowdsourcing the images. Zooniverse has several successful projects under its umbrella, including Galaxy Zoo, an effort to classify galaxies observed by Hubble and the Sloan Digital Sky Survey. Crowdsourcing was a new idea for most of the science team, but Seth said members enthusiastically embraced the idea. They spent half a year preparing some 12,000 images for public consumption, and hope to generate 50 to 100 views on each image by the summer of 2013. A Hubble Space Telescope image of a small portion of the Andromeda galaxy. Scientists have several methods to double-check the public's accuracy. These include inserting synthetic star clusters into the images as a test, as well as recycling several of the pictures the astronomers analyzed themselves. With the information that comes out of this project, the team expects it can begin to answer two major questions about Andromeda: the age of the star clusters, and how stars formed within the galaxy. "Clusters are good objects to study the formation history [of Andromeda] because they're all born at the same time," Seth said. "Rather than having a single star, we have hundreds of thousands of stars we try [identifying] because they're all the same age. We have a better handle on the age of objects." More star cluster work is already on tap with the PHAT imagery. Seth's team has picked out Hubble images to analyze for information about how fast stars and clusters are moving. For that work, the team is using the W.M. Keck Observatoryin Mauna Kea, Hawaii as well as the MMT Observatory near Tucson, Arizona. Seth estimated they have analyzed the spectra of more than 10,000 stars from PHAT. Collaborators on the Andromeda Project include several American universities, Chicago's Adler Planetarium, Oxford University and the European Space Agency.